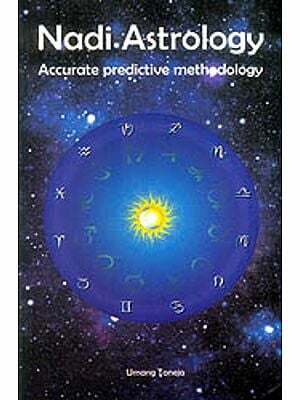 Tricks, astrological tricks of predictions, is what you must try. Over a period of time evolve your own tricks as your astrological experience with predictive techniques grows. Risks are what an astrologer must keep taking not to stagnate. A discovery is hazardous in the beginning and after its success looks like a great romance with ideas. Every successful astrologer takes risks in predicting because life is ever changing and challenging. Many of the modern problems are totally new and in the changed circumstance of our life, will remain unanswered if did not evolve new method of dealing with them. To claim to have understood all this astrologically is wrong. Not to take risk, with sound astrological technique, is to deny oneself astrological self development. So risks must be taken as has been shown in this book. These risks work is what stands proven now. The essence of Hindu astrology is its predictive brilliance with manifold techniques. 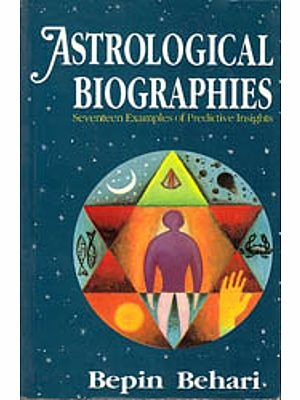 Eighteen rishis who gave us jyotisha and many more, whose name is less known, have contributed to the richest repertoire of predictive of Hindu astrology. From time to time, all over India I come across astrologers who used some of these techniques which are hinted at only in some books but not elaborated, I tried them, modified or added to them sometimes from my own experience. Every successful astrologer has those spells when the milky sunshine of predictive gives him intoxication which can ruin him. Yet, If he holds his balance the question he has to ask is what to do enter into new areas to enlarge his range and technique. He has to do it all himself as good are very few, great astrologers spring up once in a while in many decades. The astrological arena is dominated by mercenaries, frauds, successful mediocrities and those crooks who set into motion theories which they call their researches. Look at the number of wrong horoscopes of celebrities in their books to convince yourself why writers of books have become dangerous crooks ruining great astrological tradition and the greedy publishers who know nothing about astrology ever willing to publish book of new writers whom they can cheat of royalty or convert them into their salesman by insisting that they themselves sell the books of theirs which the publisher has consented to publish. 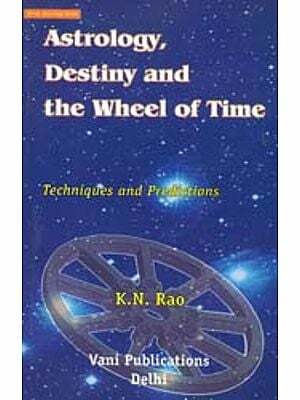 Need exists to look at predictive techniques of Hindu astrology in countless ways. I have done that all my life and feel a lifetime spent in exploring these is a very brief period. Yet, can something be done is the question every conscientious astrologer ask himself and then proceed to do it honestly-to search methods of refining his predictive techniques and enlarging them constantly. I would like to explain why I have give the title Risks and Tricks to this book. All my life I have had to take many risks to give predictions to all who come to consult me. Most of the time, it was because I had no time prepare all the details I needed, particularly in those days, when I had to do all the casting manually and predict. Sometimes, people come to consult me during office hours also when I could not have left office and attended to them. Yet, on their insistence and because of the urgency of their problems, I had to predict, which I did, without telling, by taking risk. God helped me. Something would flash in my mind, something I had learnt, and something. Which I had tested and something much more which I reduced, in later life, into my researches. My double-transit theory has always helped me. It is like a wonder drug. Other than double transit it was a quick synthesis of Vimshottari and Jaimini’s Chara dashas, which gave me quick, fast and most dependable results. 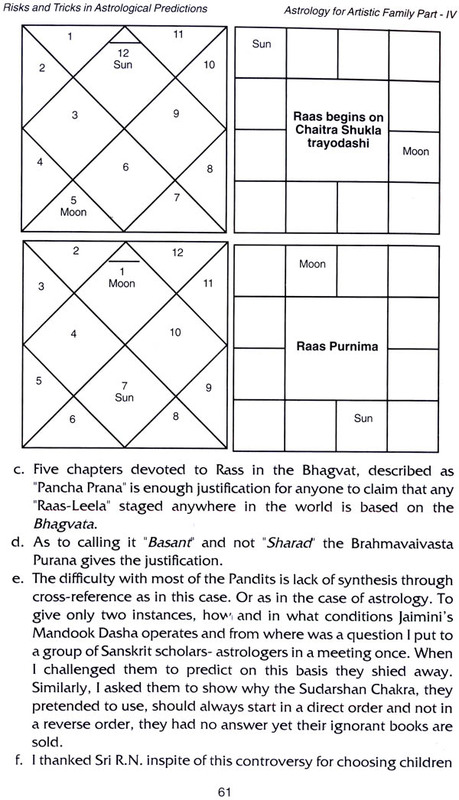 In Jaimini use only seven karakas and do the Padas without any exception if you want to avoid disastrous and absurd predictions. Never forget to use more than one dasha. 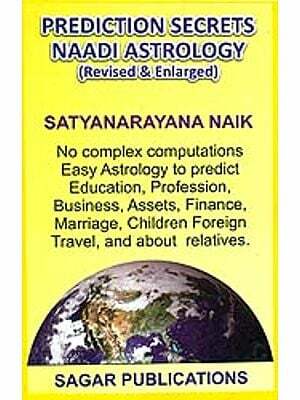 Hindu astrology is rich in the number of dashas to be used for timing events. Not to use them is to become an abysmally poor predictor. In leisure hours at home, I tried many dashas, Nakshatra dashas of parashara and Jaimini’s less known dachas, which give amazing results when they click and are correctly done. I use transits differently as I found their mechanical meaning in some books was vague and misleading. A question often asked by my students is if I have revealed them in my writings. My answer: “yes and No.”The reason is partly because they had to be kept a secret as this knowledge should not fall into wrong hands. Sometimes, I did reveal them found that the articles I wrote became heavy, too dense for a reader not knowing these techniques. I can do it more confidently now as many of my students know what I am talking about. The element of prediction is mostly in untested areas or in the employment of those astrogical techniques, which I still needed to test more and more. If I employed them I ran the risk of going wrong and if I did not I would never add to my predictive repertoire. When I had time, I used them but after employing tested methods first which have been the main basis of predictions always. But over a period of time, the risk got converted into effective predictive techniques, as sound and useful as the earlier once, on which I always fell back. This is how I discovered the use of Jaimini’s chara dasha and Mandook dashas and some other parashari dashas. That is the justification for the word “risk” in the book. In retrospect, when I re-read the articles I had written in earlier decade, I thought I could have shown the use of some more techniques there. 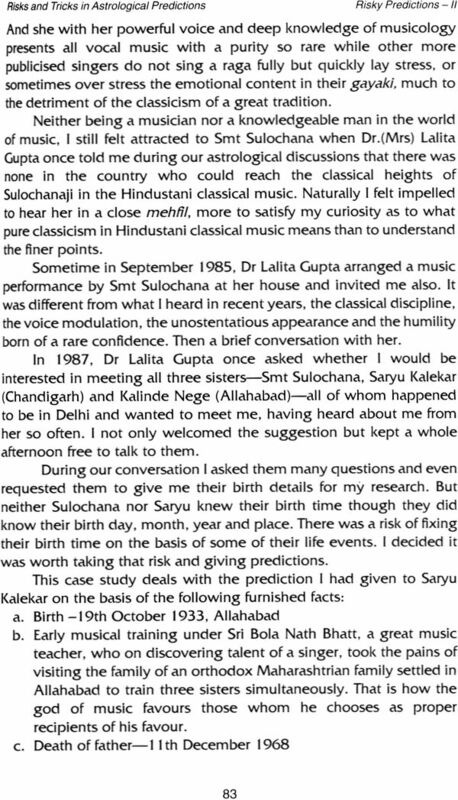 I remember my mother’s advice not to go much into predictions about marriage, children and prashna (horary) if I wanted to do research in other areas during the limited time I got in my career-as lecturer first and the Indian Audit and Accounts Service. Even now, unless it becomes absolutely necessary, I do not use prashna if the horoscope is available. Sometimes, I combine both and very rarely I use prashna, only when I cannot help doing it. 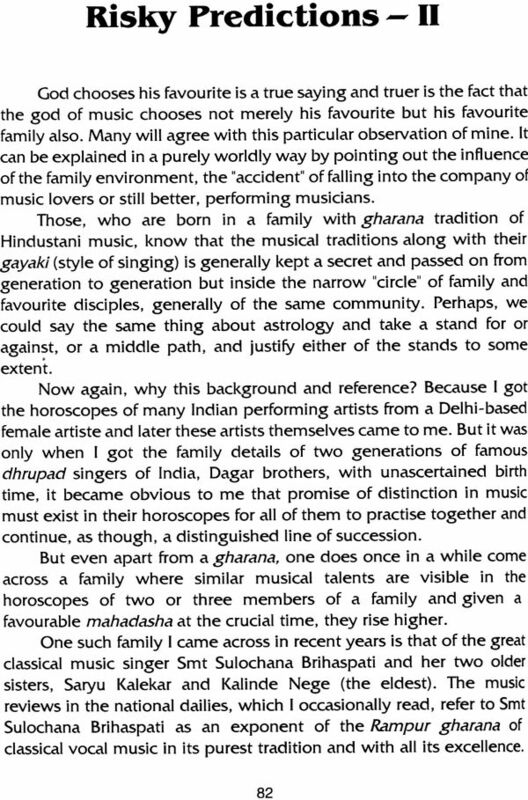 Sometime, when I wrote about it, some astrologers would get angry with me. 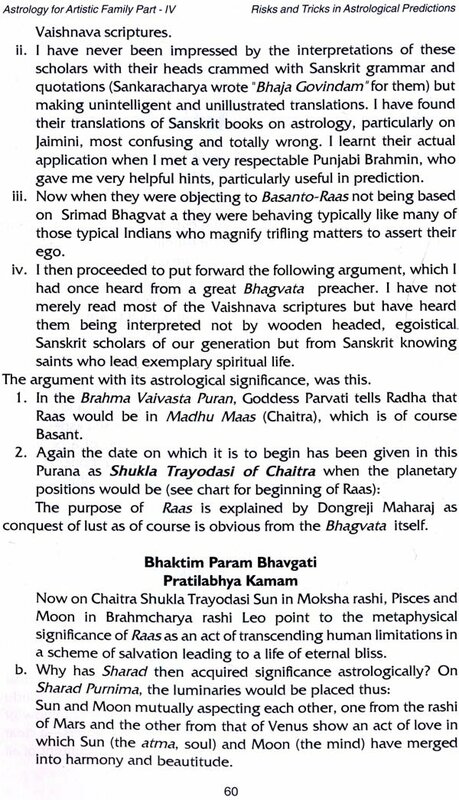 For instance, the article Simple predictions aroused some criticism against me by astrologers, who treat prashna as the be-all and end-all of astrology. 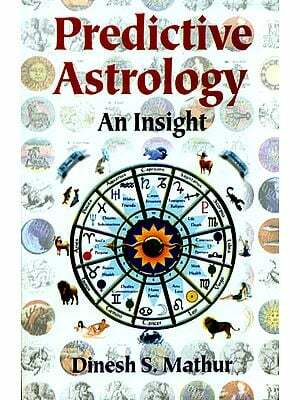 Astrologers doing prashna mostly or mainly lose their judgement of a horoscope very is my personal experience in my long association with astrologers and longer association of teaching astrology. 1. The first trick is put the planetary position of the day, mentally, when a person comes to you the horoscope and see what is “happening.” A wealth of information about the immediate present is available though this exercise (See some examples- Recovery of jeep, Prediction emerging out clearly in the section Clearly Visible). 2. Destinies are inter-related. 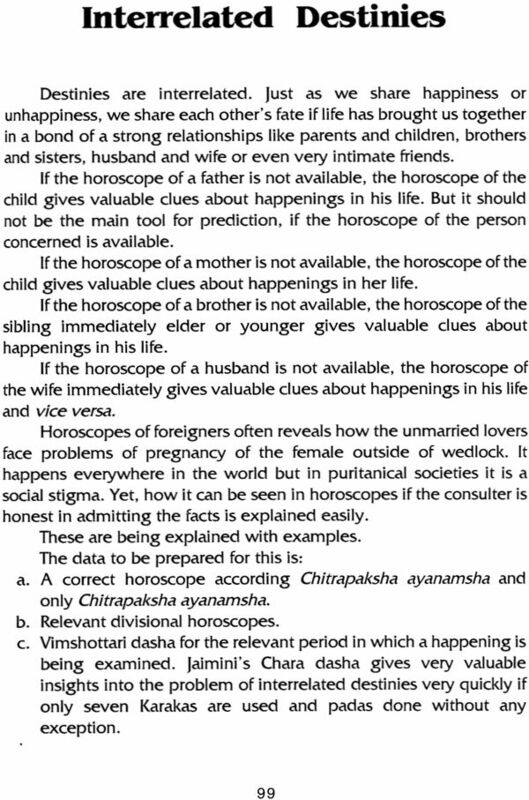 In serious cases, if the horoscopes of other family members are available check it through them to confirm an event. 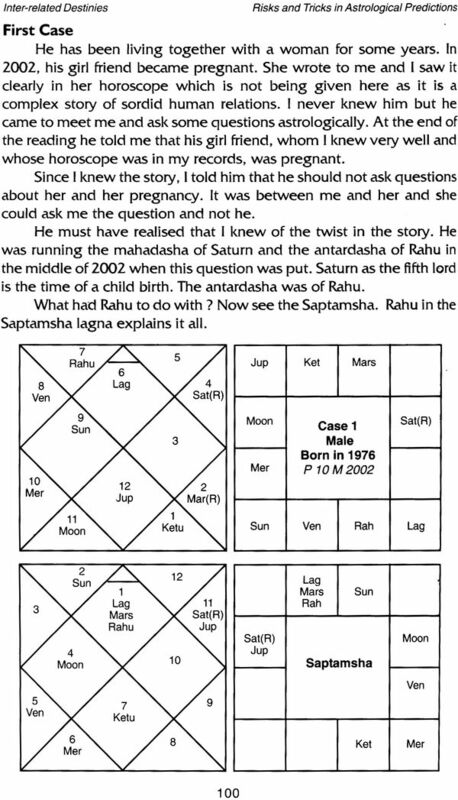 This was the advantage reja-jyotishis of bygone decades used to did astrology for an entire family and had all the family horoscopes. I also keep them and use them when necessary. 3. Use two or even more dashas to cross-check an event. This is a very effective technique, which I employ using sometimes even four or more dashas. 4. Vargas must be used invariably. Use only Lahiri ayanamsha or Chitrapaksha ayanamsha. 5. Transits are very good. but only after the dasha results are analysed soundly. Preferably do them with ashtakavarga. a. The lagans lord Venus, which is retrograde, has gone into sixth house lagans but is fortunately eleven degrees away from sun. But it is bad because it has exchanged places with the sixth lord Jupiter. b. Saturn-Mars opposition along with 2/8 axis is rather bad for health with the fear of it becoming serious. c. Murtha in the eleventh house is showing it to be a year of achievement, which it was but its lord, Sun, again goes into the sixth house. 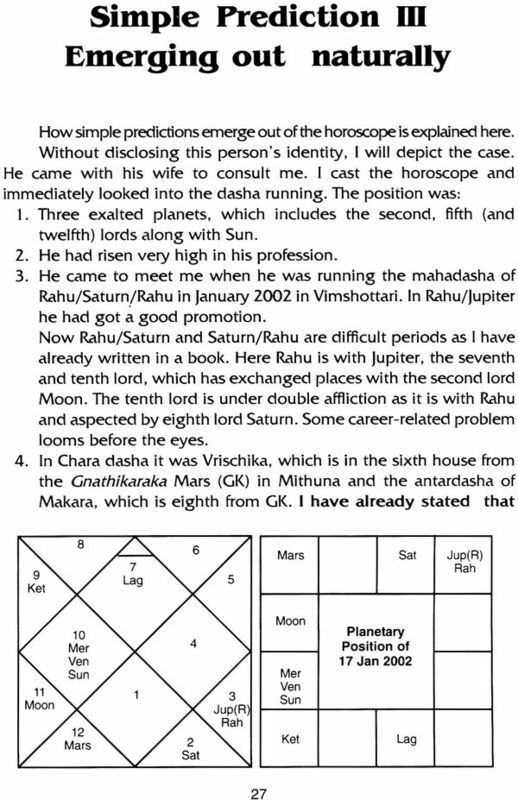 d. Navamsha was Kumbha with Saturn, lagna lord in it but Mercury, the eighth lord in the seventh house. Thus the connection of the lagna lord with eighth lord comes into play again which is an important factor to be seen in understanding the problem of health. 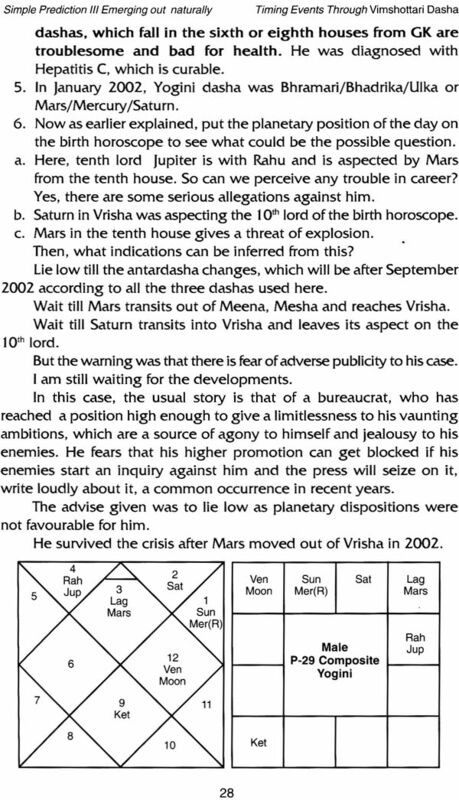 But in the Navamsha, Jupiter is vargottama which in this case earns the lord becoming and Venus the lagna lord of the annual horoscope is in his house but accepted by Mars showing a prolonged treatment without any fear to life though there would be complications. astro-medical diagnosis proved correct. Now the readings of the annual horoscope must be in harmony with the birth horoscope in which this student was running the dasha of Saturn in the twelfth and the antiracial of Rahu associated the twelfth lord moon showing hospitalization. During my service years, I either typed out the articles I contributed to astrological journals or dictated them to my stenographers whom I trained in the art of drawing horoscopes and using the vocabulary of astrology, which I expected them to know. After correction initially, it become easy to dictate articles without which facility I could not have contributed more than 120 places in English and nearly twenty in Hindi in less than ten years. My book writing started in the last year of my retirement from service in 1989-1990. Then spasmodically the production of books continued till 1993 after which it became regular, with me writing books and guiding, editing others’ books too till it about six years the total reached forty.